Interested in immersing yourself in the realm of modern Thrash Metal? Already worn out the genre, but still can never get enough? Trying to submerge somebody else into Extreme Metal with good intentions? From Los Angeles, California, OMICIDA release their second full-length record “Defrauded Reign” as a follow up to their previous debut LP “Certain Death.” Although the five-piece haven’t had a whole lot of recognition since their formation in 2014, they aim to destroy and pierce souls with an interesting take on Thrash Metal and Power Metal - all contained within gory, unpleasant imagery and meticulous musicianship. Initiated by a high pitched trill and thrown into a relentless whirlwind of speed-induced, new school Thrash Metal, “Hostage In The Pit” does little to tame Barbieri’s grisly, occasionally tame vocals, and Durst’s onslaught of progressive grooves. OMICIDA carries on the tradition of composing Modern Thrash in the same vein as bands like WARBRINGER and POWER TRIP, with lyricism focusing primarily on misery, war, and death. Although not much can differentiate their sound from their peers, the individuality in the vocals, use of acoustic guitar, and song variation derive a slight hint of Doom influence. “Protect and Serve” proceeds to pummel right back into the listener’s ear with the bashfulness of Durst on drums, only to be overthrown by a handy guitar groove. There is a change in vocal style from potent, scratchy high screams to more melodic, well fitting ones in line with the rhythmic tempo of the guitarist. The band’s attempt at adding influence of Power Metal and other lighter elements create a fluidity between songs that is absent in other New Wave Thrash Metal bands. Of course, to some listeners this can be seen as a negative, especially if one is used to pure and blatant riffage and machine gun vibrato. 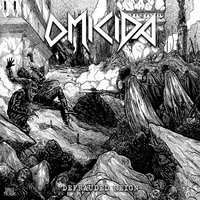 OMICIDA can be seen as a gateway Thrash band to those who aren’t used to a loud consistency - which is far too good of a quality to have - and in no way do the band’s experimental features limit their credibility in the Thrash Metal war-themed world. In other words, it will arouse a different feeling. The opening guitar track to “Sentenced” is layered with a savoury acoustic instrumentals and a sinister spoken word delivery from the vocalist, followed by a precision-laced guitar riff. This track is a perfect example of how the lyricism and variation contributes to the listener’s mood, and while less upbeat, it remains a nightmare inducing, claustrophobic track to spook the listener. “Dead Eyes See No Evil” falls as the closing track for “Defrauded Reign” by our Thrash Metal newcomers. The recurring theme of death and utter destruction holds true until the vocalist’s very last breath is spent on the phrase “DEAD EYES SEE NO EVIL!” as the track comes to immediate end. Instead of an expected, acoustic fade out, OMICIDA exits with a head-on collision. They are a new, exciting and brutal force in the Metal world, who are destined to find their definite sound whilst not falling short in utilizing the ferocity they harbor.